The Platinum-Cobalt (Pt-Co) color scale measures the “yellowness” of a liquid and is well suited for quality control and contamination detection. The Pt‑Co scale is used to evaluate pollution levels in waste water and for drinking water quality control and regulation. 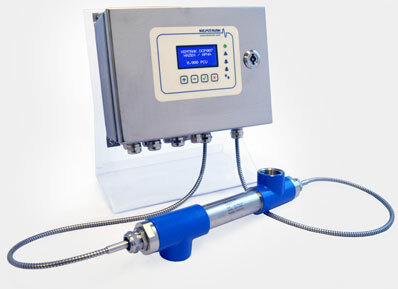 The Pt-Co scale can also be used to measure and control the concentration of iron in groundwater. The Kemtrak DCP007 is a maintenance free industrial photometric analyzer that can accurately monitor water color from highly polluted waters (>1000 Pt/Co units) down to clear liquids at <1 Pt/Co units. Real time measurement results are displayed in units of PCU (Pt/Co), Hazen or APHA. The Kemtrak DCP007 uses a high performance long life LED light source with robust industrial fiber optics to provide a measurement with very highprecision. A proprietary dual wavelength four channel measurement technology allows accurate measurement of both highly colored and trace color levels. The primary “absorbing” UV-VIS wavelength accurately measures water color, while the second reference NIR wavelength, which is not influenced by the water color, compensates for turbidity and/or fouling of the optical windows. Since optic fibers are used to transfer light to the measurement point and back, the measurement cell contains no electronics, moving parts or sources of heat. Standard measurement cells are manufactured in robust sanitary grade stainless steel and use sapphire windows to provide a long and maintenance free operation. Calibration is simplified using an automated QuickCal one point calibration. Measurement drift from LED light or filter aging is negligible and instrument recalibration is not required. Click the button below to add the Water Color Monitor - KEMTRAK DCP007 to your wish list.